Y’all know I love me some cocktail hour. It’s a tradition I grew up with (although obviously not always with alcohol involved!) When I was young it meant Shirley Temples with cheese and crackers!! To me cocktail hour signifies the end to the day (whether that’s a day of sightseeing or work meetings) and the beginning of a relaxing evening. I find myself craving a drink everyday at 5pm, especially if I’m about to start cooking. But that craving isn’t for alcohol itself (that’s just a nice bonus!). The craving is for the clink of a glass, a dance of flavor on the palate and the nostalgia of that time of day. There’s nothing like a glass of wine to sip while cooking, but alcohol (as you know) isn’t something I recommend daily for your healthiest life. 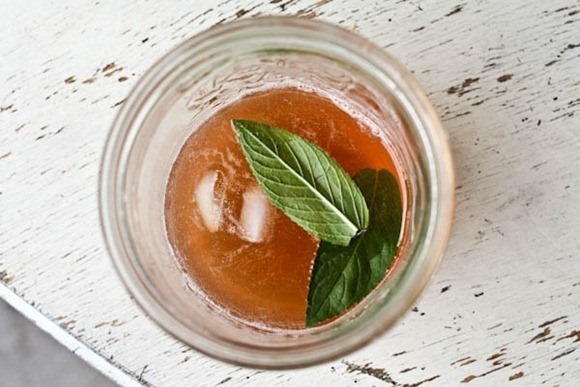 Thus, here are 5 non-alcoholic cocktail hour ideas to help you unwind without the booze. 1. Seltzer water with a splash of anything. 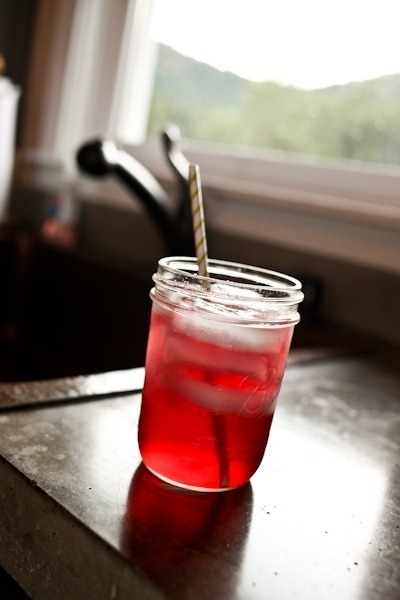 The bubbles ooze fun and a splash of juice, lime wedge, lemonade or a cherry add a hint of flavor so you don’t feel like you’re having just another water. I know I promised non-alcoholic, but a splash of wine or beer will also really enhance the flavor of your bubbles without getting you tipsy. This was one of the mocktails I had on our Jamaica trip when I was 4 weeks pregnant! 3. Kombucha. 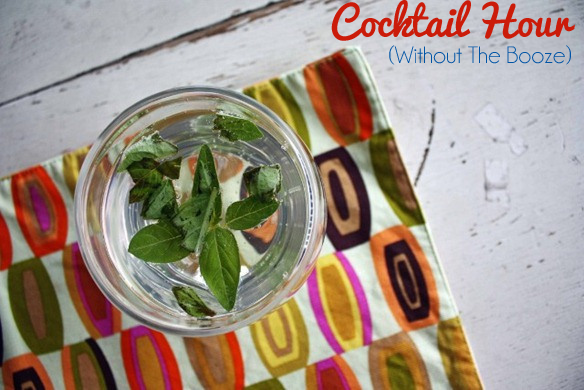 The oh-so-popular healthy "cocktail." 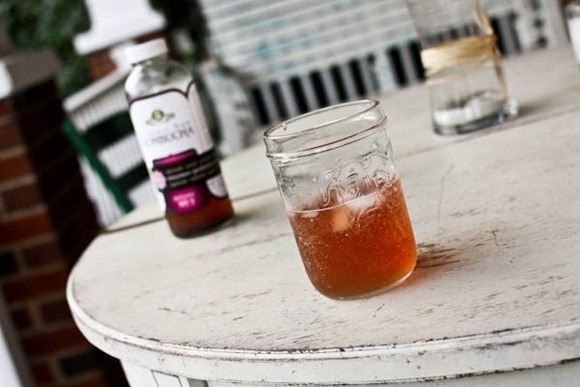 Kombucha has the intensity of a mixed drink without all the loopiness. It comes in tons of flavors, so if you haven’t found that it suites your fancy, keep experimenting! 4. Iced tea. Ok, so a glass of iced tea is more of a dinner table staple than a cocktail hour drink, but my point here is that I need something tasty on ice to sip while I relax on the porch at 5:00. I loved the raspberry leaf tea I brewed at home while I was waiting for Mazen to arrive, and mint teas with a fresh mint garnish are thismuchcloser to being a real mint julep! 5. Fresh juice. Fresh juices are the backbone of many a cocktail, so when you need something refreshing to sip (or guzzle) juice is a great option. The Juice Laundry here in Cville makes a citrus + cayenne pepper juice that is amazing for cocktail hour – and you could replicate that at home with OJ, lime juice and a wee pinch of your spiciest spice! Serve it in a wine glass for good measure. **I know some of you are going to suspect I’m pregnant again, but alas I am not! I promise! I’ve been meaning to write this post for ages! Can You Grow Oats At Home? As a non-drinker, I appreciate the recipes! Thanks! This is an awesome round up! I’m not of age yet, but I don’t like alcohol anyways and have no desire to drink. But it’s nice to enjoy a fancy, fun beverage every now and then! Big fan of seltzer water! thanks! there’s a party friday night and I know of a few teetotalers that will be in attendance. Hi Kath…another low, but not no, alcohol option is sparkling water/club soda with a few dashes of orange bitters. Bitters on their own are pretty high in alcohol but only using a few shakes of the wrist allows for a treat that seems more indulgent than it is. Cheers! I was thinking about this and this is probably on par with the amount of alcohol that vanilla extract adds to a cookie recipe – so basically negligible! Drink up! Yeah, but still worth noting Kanz! It’s funny you had to put the disclaimer in there 😉 – your header made me wonder for a split second too. We have a couple friends who do not drink at all. They both had family members who drank, which morphed into much bigger and dangerous issues. So, it’s great to have ideas for something fancy you can serve someone so they feel a part of the before-dinner glass-clinking without the booze. love this post, great ideas! 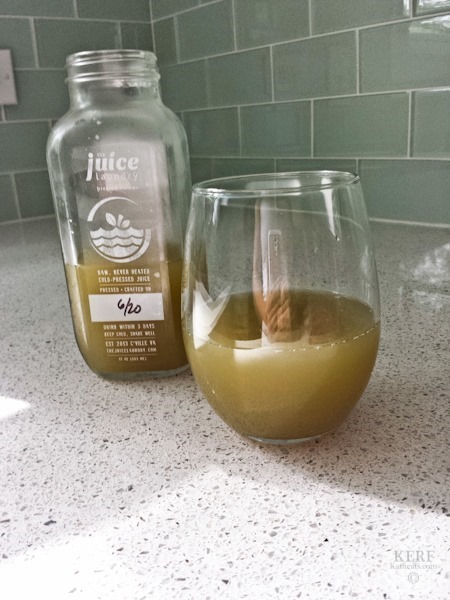 What is in that brown “juice”? It looks like muddy water. I’m not sure I could even get myself to try that one. Also, this post surprises me as it seems like you are always posting alcoholic beverages on the blog and instagram. Have you been cutting back lately? I don’t drink much, but am back in grad school where everyone drinks…a lot. I don’t mind one here and there, but I feel it quickly and don’t love that feeling. I’m big on my soda stream – it feels like such a treat! It’s green from all kinds of fresh veggies! I generally only drink water when I am not drinking alcohol but those sound soo good I might have to try one! 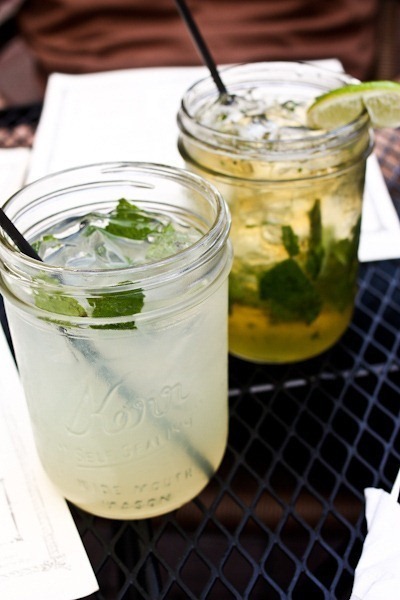 What a fun twist on drinks! Among the things I learn from you, Kath, is that there even IS such a thing as a “cocktail hour tradition” and that there are people in America that “grew up with it.” I’m from the Midwest and you and I might as well be from the opposite ends of the earth! LOL. Is it like the tradition of tea time in Britain? Where you take a late afternoon break for a drink and snack and then eat a later dinner? I’m sort of gobsmacked. Thanks so much for sharing this Kath, I just love this post… mainly because of my similar fond memories of our family’s cocktail hour tradition. I grew up half in Southern California and half in NY and for us it was always about honoring the re-gathering of the family each evening as a transition between end of day and dinner hour. It rarely included booze (unless it was one of my parents’ fancier parties) but the ritual always involved beverages and foods that weren’t served any other time. My dad’s fav was raw cauliflower florets dipped into my mom’s herbed mayo and a Vernor’s soda. We always begged for maraschino cherries in ours. It was a pretty common among our family members and friends… love to hear about others’ traditions… and now I’m a bit sad that it’s never been a part of our busy family’s modern life here in Atlanta! I can’t believe I never considered this before! There’s that half hour between when I come home and when I’m ready to cook dinner and I just want to unwind. I automatically want to pour a glass of wine or open a beer but I really don’t like drinking that often or having all those calories. I think today I’ll pick up some seltzer water, pick some mint from the garden and cut up a lemon. Well, you may not be pregnant, but this post is perfectly timed for me – because I am 🙂 Thank you for the ideas! I was getting a little tired of my usual seltzer + lime combo. Oops, forgot to edit! I meant I *am* looking for fun alternatives! I love sparkling water with a little fruit juice in it. Makes me feel fancy! 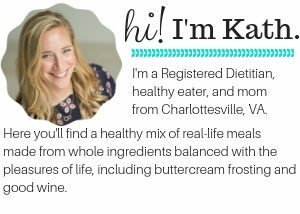 I also love KeVita drinks – have you tried them? Sparkling probiotic drinks. The mango one tastes like a bellini! I would love to have a cocktail hour every day. Especially while I’m cooking, but since I limit myself to real cocktail hours on the weekends only, I will sometimes buy lemon or lime flavored sparkling waters and it definitely hits the spot. Hooray for cocktail hour and family traditions! There really is nothing like a quality cocktail, nice glass of wine, cold craft beer (or alcohol less beverage) after a long day at work. Sit on the back porch with a small plate of snacks like, nuts, cheese and veggies + hummus, soo perfect! 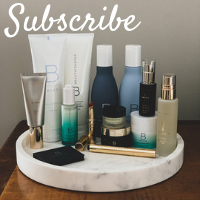 Oh and when is the next Quarterly box getting shipped?? So excited for the next arrival! I’m not quite sure yet! Haha I don’t have them all in one post. I’m really just a bourbon girl plus lots of wine and beer. After years of working Friday happy hour as a bartender, I still get antsy at 5 pm Friday to be somewhere, doing something! My grandparents were big happy hour fans. They regularly sat on the porch or in the back yard with their next door neighbors, who also enjoyed an afternoon beverage. We are often having beverages of some sort or another in the yard with our own neighbors, although now that school has started up, the luxury of those lazy summer afternoons are over. I do love myself cocktail every now and than, especially after a stressfull day (bad excuse to drink, but sometimes you just need a stiff one). Anways, as I dont drink that often these ideas are much appreciated! Thank you for this post! I bookmarked it. It’s very helpful!! Great Post!! I know that feeling, the after a long day beverage! I am totally with you on it not having to be alcoholic too. I just like the bubbles. Soda water and a splash or twist of anything is usually my go-to! Incidentally, I followed your link to the Jamaica trip! I hope you don’t mind me going off-topic here just briefly, but I was wondering if you could tell me whether the resort you went to was on the quiet or the loud side? It is *exactly* the place my husband and I were thinking of for our honeymoon (we didn’t have a proper one after married) but we’re not too keen on wild partying – we are sooo in need of a rest! Thanks so much and looking forward to the next posts! Great, thank you! Off to book my holiday! I was just wondering this with a friend: can you have Komboucha while pregnant? Everything I’ve read says that if it’s commercially produced (= safe and very very low alcohol if any at all) then it’s OK but to be weary of homebrews that might not be safe and/or have higher alcohol content. As always, best to check with a doc! I definitely like a glass of vino while cooking dinner. But with two boys (the younger a couple months older that Mazen), a full time job, and twenty stubborn baby pounds to lose (which just don’t come off like they used to after 40.) – I just can’t spare the calories. So now I use a soda stream and have bubble water with lime or lemon.